Super Bowl LI is going down at NRG Stadium on February 5, 2017, and it promises to be a true Texas-sized showdown. Thousands of gridiron fans will fill the stadium in Houston, TX, and they’ll live out their ultimate football fantasy as they watch the final two teams lay it all on the line. Plus, attendees will witness larger-than-life pop star Lady Gaga perform during the Super Bowl LI Halftime Show, which is sure to deliver big entertainment to match The Big Game. Fans visiting Houston for Super Bowl LI should go for the goal and see everything that the great city has to offer. To help you get the most out of your trip, we’ve put together a roundup of our top Houston picks, from great spots for food to perfect places to stay.Learn more about the city and its world-class stadium, then read on for our entertainment, restaurant, and lodging suggestions before you witness the game of a lifetime. Houston’s multi-purpose NRG Stadium will host The Big Game for the first time since Super Bowl XXXVIII – when the venue was still called Reliant Stadium. But a lot more than the name has changed in the past 13 years, both for fans and players. #FBF to 2004, the last time the Super Bowl was hosted at #NRGStadium! ?? Athletes will take advantage of cutting-edge artificial turf that provides better traction and non-stop action. Attendees will be dazzled by the size of the stadium – 71,795 seats including 7,000 club seats, 198 luxury boxes, and several bar and lounge areas. Fans can also view two of the largest high-definition screens in the world. And a retractable roof ensures an enjoyable, safe game in all weather conditions… You just need to be ready for some football! Everyone in Houston is eagerly awaiting Super Bowl LI – in fact, they’ve set up four giant clocks around town to count down the days, hours, and minutes until The Big Game kicks off. Houston’s Super Bowl Host Committee has designed tons of great activities to keep visitors and residents engaged. Downtown Houston’s Discovery Green will host Super Bowl LI starting on January 28, a free-to-the-public exhibition that taps into football excitement. For the week leading up to Super Bowl LI, this attraction lets your whole crew enjoy interactive exhibits, fun games and prizes, live music, and tasty bites. True fanatics can get even closer to the game with the NFL Experience Driven by Genesis, which sets up shop at the George R. Brown Convention Center on January 28 and functions like a football theme park with on-the-turf clinics and player autograph sessions. 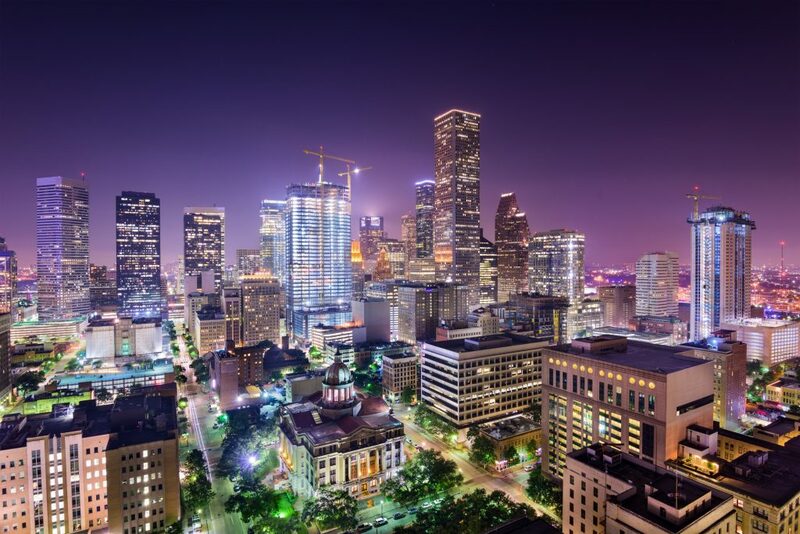 The biggest city in Texas, Houston is a vibrant, diverse, and spacious metro with everything from ranches to beaches – plus cultural landmarks lurking around every corner. Houston, we have no problem with your rich history of space exploration. After being the home base for NASA missions for much of the Space Race, the Houston Space Center has interplanetary artifacts galore that will fill stargazers everywhere with a sense of wonder. The eighth-largest mall in America, this mixed purpose shopping center is truly a sight to behold. The main thoroughfare includes nearly 400 upscale stores, a gigantic skylight, and a full-scale ice skating rink. People looking for free outdoor excitement can’t go wrong with the 7,800 verdant acres that compose George Bush Park. With numerous playgrounds, jogging trails, and even a shooting range, it’s a go-to destination for outdoor fun of every variety. The city has an extensive network of underground tunnels and above-ground skywalks that will connect you with tons of resorts, retail stores, restaurants, and gift shops. The unique city beneath the city gives you access to everything Downtown Houston has to offer while keeping you out of the Texas heat. Whether it gallops, slithers, or soars, you can bet that you’ll see it doing its thing at the 55-acre Houston Zoo. Tap into your wild side and feel good knowing your ticket is helping fund the preservation and study of endangered species, making this a real win-win. The Menil Collection will catch you up on the past 100 years of art history with pieces ranging from Picasso to today’s aspiring masters. After the museum, head to the near-by Rothko Chapel for a meditative experience that’s just as serene as it is colorful. The best part is that both locations are completely free! Lovingly nicknamed the “Garage Mahal,” this collection features tons of uniquely painted and repurposed automobiles that are equal parts fun and funky. Another great find in the city’s museum district, the Houston Museum of Natural Science is sure to spark your curiosity. This free-to-the-public learning center makes science fun with fascinating attractions like the Wortham Giant Screen Theatre, the Burke Baker Planetarium, and the Cockrell Butterfly Center. A can’t-miss destination for high culture in H-town. Here you can find the Houston Grand Opera, Houston Ballet, Houston Symphony Orchestra, and Alley Theatre along with the adjoined Bayou Place entertainment complex – in other words, something for everyone! There’s no shortage of amazing restaurants in Houston. Here’s a small sampler of our favorite mouth-watering picks to get you started. Sink your teeth into all the juicy flavors of Pappas Bros. Steakhouse, where they butcher their cuts in house and age them using a tried and true 28-day, wet-dry aging process that maximizes the flavors – then pair it with a premium selection from the restaurant’s whiskey cart or wine menu. Local restaurateur extraordinaire Chris Shepherd’s goal with Underbelly is to take culinary enthusiasts on a culinary and cultural journey through Houston. The daily menu changes based on what’s coming in fresh, but could include anything from slow-cooked pork to Vietnamese flank steak. Dish Society puts a modern, farm-to-table spin on Southern cooking and provides a casual dining atmosphere that’s great for any occasion. Start your day with breakfast tacos, go traditional with shrimp and grits, or try something truly new with their signature coffee-crusted pork tenderloin. Escape the heat with some subterranean suds in this booming underground pub that offers 60 beers on tap. Pair your brew with one of the many pop-up restaurants that service this gourmet food hall, which range from modern crepes to fusion tacos depending on the day. Pax Americana elevates traditional cuisine with a wide variety of inventive and scrumptious farm-to-table vegetable, meat, and fish dishes. But be sure to save room for dessert: their smoked vanilla churros or white chocolate cherry mousse will sing a sweet symphony for your taste buds. There’s plenty of great places to stay in H-town, ranging from the affordable to the luxurious. Check out these places to get you started. You won’t get much closer to NRG Stadium than this budget hotel, which is less than a half mile from the epic action of Super Bowl LI. NRG stadium…. Here on business! Kind cool to see where the Texans play. JJ!!!! This upscale hotel in the heart of Downtown gives you agreeable accommodations and convenient access to the Metro Lightrail that will take you to the stadium. Thanksgiving has come and gone and now is the perfect time to treat yourself to a little #staycation. This chic hotel offers visitors easy access to Downtown Houston as well as splendid views of Memorial Park. While there are four hotels within the Houston Galleria, we give our nod to the two Westins for their four-star accommodations. “We had a wonderful stay. My boys loved everything from the elevators, to the wide hallways, to the big beds, and of course the huge sliding glass window…Thank you! !” @mommanoodle Thank you for choosing Westin! Pamper yourself with a get-away at The Houstonian, which combines luxury lodging with an onsite spa.